Last Saturday I spent the afternoo n being a book in a Human Library event at the Wellcome Collection in London. The idea behind the Human Library is to challenge prejudice through conversation – people who have experienced various kinds of social exclusion, stigma or discrimination act as ‘books’ and members of the public can borrow them for a twenty minute chat about their life and experiences. 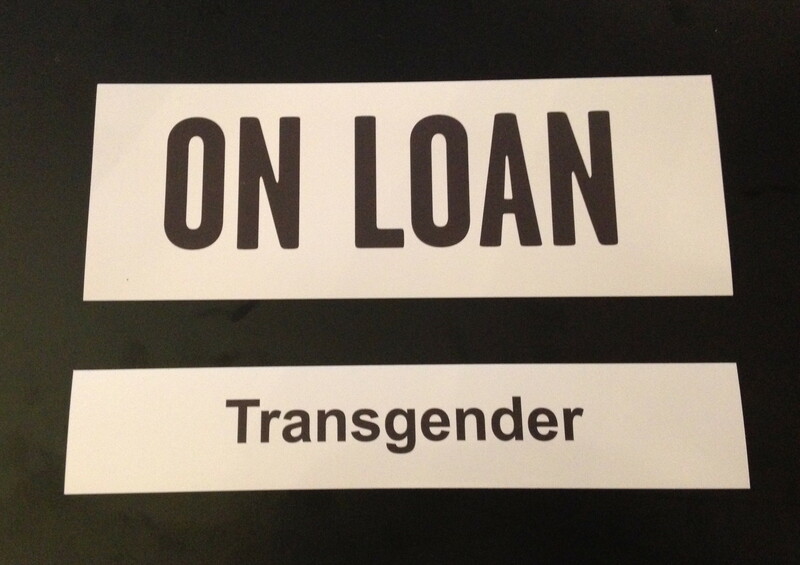 As a book my first challenge was to pick a title for myself – I settled on ‘transgender’. Other titles in the library included ‘migrant’, ‘schizophrenia’, ‘sign language’, ‘homelessness’, ‘self-harm’, ‘looking different’, ‘refugee’ and ‘no arms no legs’. Sitting on the bookshelf (a long table in the Wellcome Collection’s reading room) with the other books there was an element of the freak show about the proceedings. In having to single out just one aspect of my identity as a sign to appear under, literally, other sides of me were erased. This is something which is unfortunately built into the format of the Human Library. It cannot help but position the books as ‘other’ and by default the readers as ‘normal’. It does rather suggest that the readers’ identities, or the lack of prejudice they experience, requires no further explanation and in so doing reproduces the kind of thinking that treats difference as inferiority. As I was reduced to the thing that makes me exotic and special, the ways in which I was the same as my readers, or in some ways more privileged, were lost. Despite, or perhaps because of, these initial reservations I enthusiastically volunteered to be a book. I am interested in different ways of challenging prejudice, plus I was intrigued about what types of questions people would ask me. Although transgender people and politics are more visible now than ever before, I wondered what kind of awareness of trans issues my readers would have, if any. As it turned out people asked some basic questions and some less-basic questions, but thankfully nothing that fell into the realms of the completely ignorant or offensive. A lot of people asked when I knew I was transgender and about whether I had been girly or boyish as a child. I guess this speaks to a recognised narrative of a journey or struggle to find or accept one’s ‘true identity’ which isn’t how I personally experience being trans (I do spend my working life teaching post-structuralist gender theory after all). Because I identify, and attempt to live, as non-binary, i.e., as neither male nor female, I was actually quite anxious about not being able to perform the kind of ‘transgender’ the public might be expecting; about not being ‘trans enough’ to pull off my book title. Sure, I can talk about the things I’ve changed in my life, about diagnoses and surgery and pronouns (I use the gender-neutral ‘they’), but I still found myself almost apologising that I couldn’t give an account of myself that ended up somewhere fixed and definite. However, in this artificial situation where I was being presented as ‘transgender’ the book, I got to be an authority for once. By recounting my experiences I was able to challenge the idea that there is only one way to be trans and to complicate the narratives for my readers. Given the aims of the event as a whole it was also not surprising that people asked about the kinds of prejudice I experience. Handily, the government recently provided an excellent example of this in their response to a petition calling for people to be allowed to self-define their legal gender. The Ministry of Justice stated that they were not aware that being non-binary resulted in any ‘specific detriment’ and then that ‘non-binary gender is not recognised in UK law…it is not Government policy to identify such people for the purpose of issuing non-gender-specific official documents’. Not being allowed to exist in a legal sense sounds like considerable ‘detriment’ to me. It’s not that government/legal recognition is the only goal, but it would probably be nice to be officially real. Ultimately being a book at the Human Library was a surprisingly positive and affirming experience. Going into the event I thought it was only going to benefit the readers, but participating as a book gave me the opportunity to reflect on my experiences and talk about things that, all too often, people don’t ask about and you never get to say. All my readers were great – engaged, respectful and believing. I hope they learnt as much from it as I did. I would certainly take part in more Human Library events, and next time I’d definitely try and ask my readers more questions about why it was they weren’t on the bookshelf themselves. Perhaps then not only prejudice, but normalness could be held up to scrutiny.